The weekly pick-up of organic waste (compost) is on Tuesday, starting at 7:00 a.m. 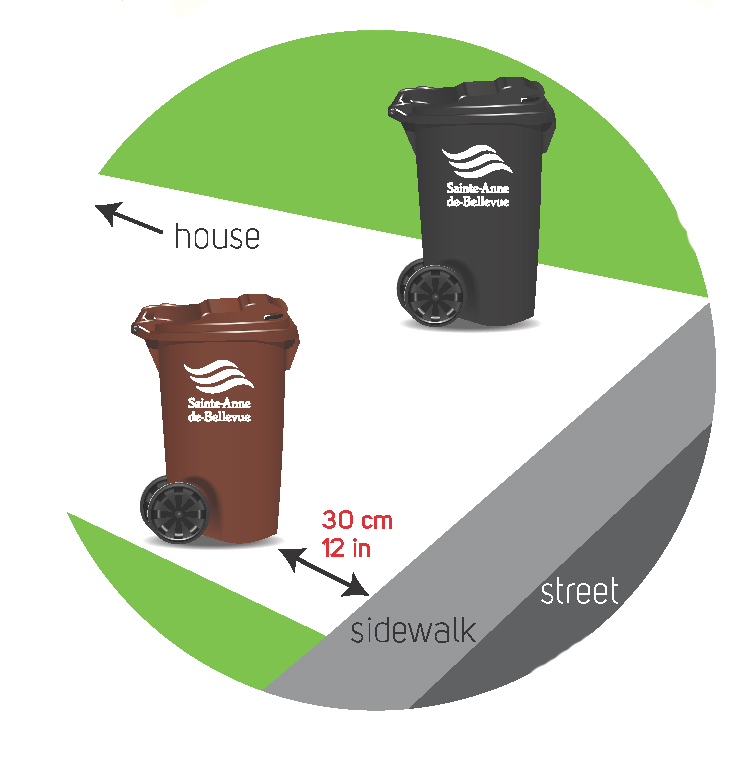 Roll out your brown bin to the curb after 7 p.m. the evening before collection day or before 7 am the day of. The wheels need to be turned towards your house, just as for the recycling bin. The lid should be closed completely. Can I change the size of my bin? Yes, but only to increase the volume! Contact us and we will evaluate your situation. Under no circumstances will plastic bags be accepted in the organic waste collection. This includes biodegradable and compostable bags as well as those made of cornstarch. They cause odours and fly away in the outdoor composting platform. Extra garden waste, such as autumn leaves, can be placed in paper bags, cardboard boxes or empty garbage cans next to your brown bin. They will be collected on Mondays at the same time as organic waste removal. Where can I buy paper bags? In department stores, grocery stores such as Marché Richelieu, etc. Old newspapers also works really well! To order online, you can visit Cascades' website. 40 bags for $18,99 + tax ($0,475/bag). You may also want to visit also the Bag to Earth website. For the DIYers, it is possible to make your own bags with newspapers, consult our explainatory document. Although the City of Sainte-Anne-de-Bellevue collects both green and food waste, it also promotes grass recycling (leaving grass clippings on the ground to take advantage of their benefits) and home composting (composters can be purchased at City Hall for $30). You do not need to have this organic waste collected since you can benefit from your own home composting. Keep doing it! However, you should know that you can add many things to the brown bin which are not recommended for your home compost. * The emerald ash borer having been detected on the island of Montreal in the summer 2012, hardwood tree branches, regardless of their size and length, will not be picked up during organic and green waste collections. • Keep the cover of the kitchen bin and of the wheeled brown bin tightly closed at all times. • Sprinkle some salt in the bin or spray with vinegar, if needed. • Avoid putting liquids in the wheeled bin. Will there be a leaf collection in the fall? Every Monday!!! You can put paper bags filled with leaves next to your brown bin and everything will be picked up during the free organic waste collection. You can also put the leaves in non-waxed cardboard boxes or in empty garbage cans. Piles of leaves on private properties will not be picked up. Raking or leaving leaves onto the street is strictly forbidden and subject to a fine. They can block sewers and are a danger for traffic. Can Christmas trees be left with the organic waste? No. Once the Holidays are over, the City holds special collections to pick up Christmas trees placed by the side of the road (and not in the street). In order for a tree to be picked up, please make sure that all lights, ornaments and nails have been taken off. Please consult the City's announcements during this period for full details. The trees that we pick up will be shredded and used for horticultural purposes.